The other day while I was cooking I felt a tap on my arm. I looked down and saw Arthur (one of our first graders). “Right Luisa that humans can’t walk on water?” he asked. “Right!” I responded. Before I could say anything else he hurried away back into the toy room. Arthur was back in the kitchen clearly upset that Uriah was making false claims. Uriah trailed in right behind him. I asked Uriah why he was lying to Arthur. That’s when it hit me. I was so busy being a logical and reasoning adult who does important adult things that I couldn’t think like a child. It never crossed my mind that Uriah might have been playing a game. I knew about basilisk lizards, but what’s striking is that little Uriah learned about them somewhere and did not forget. 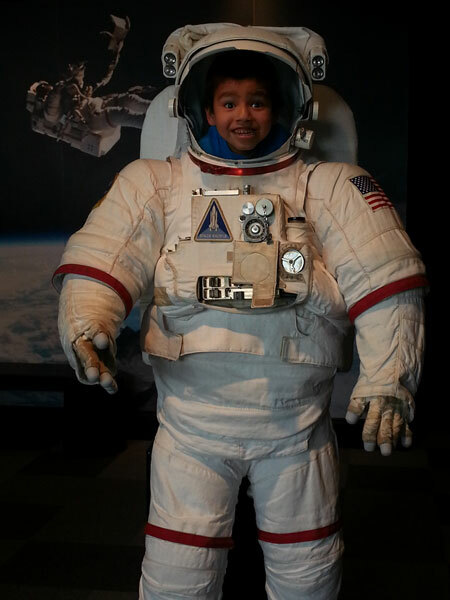 Uriah tries out the space suit at the museum the Lakota boys visited on a weekend trip. Boys: one moment they are superheroes and another they are basilisk lizards! Their minds are so inquisitive. They inspire me on a daily basis to keep creating, trusting, exploring, believing, learning, and of course: to not turn into a grumpy adult. This past weekend during our three days off, Jachin and I tagged along with the other set of house parents on a home trip with the boys. The destination was Sioux Falls, South Dakota, which is only about two hours away. They took a St. Joseph’s mini bus and we drove behind them in our car. We took them to Falls Park, they swam their hearts out at the hotel’s pool, and we visited Chuckie Cheese as well as the Washington Pavilion. Needless to say, the boys had a blast. One of my favorite parts of the trip was going to the Washington Pavilion of Arts and Sciences. There, we visited the Kirby Science Discovery Center, which has more than 100 interactive, hands-on exhibits. I was amazed by how interested and entertained the boys were. They looked like little explorers on a mission! Uriah had such fun. I think its great you take these kids on trips like this. He looks so excited to be there.. He definitely did. We’re so lucky to be able to take these trips a few times a year thanks to the generosity of our donors. All our kids grow from these special experiences!